NEW in 2015. 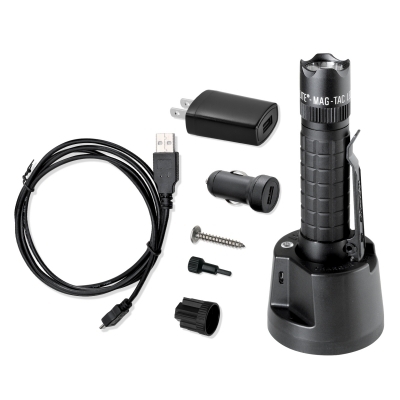 MagTac LED Rechargeable Flashlight System. A great employee service award. No minimum order. NEW in 2015. Made in USA. We laser engrave your corporate logo on this highly advanced LED MagLite. It comes with a detachable pocket clip so you can keep it where you need it. The charging base is USB-powered or 120 volt powered, using the enclosed 12 volt adapter, or any other charging source that has the USB 2.0 standard. The amazing battery is a high capacity LiFePO4 (Lithium Iron Phosphate), and is rechargeable in only 2 1/2 hours. This version has a smooth bezel, but we also have a crown bezel available at a slightly higher price. National Tactical Officers Association (NTOA) Member tested and recommended and certified. 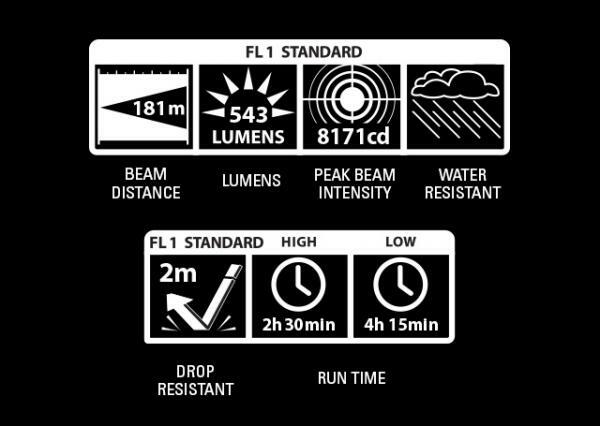 The specifications are in the chart below. It contains beam distance, Lumens, Peak beam intensity, Water resistance, Drop resistance, Hours of stamina in 3 different modes. Your 3rd Generation MagLite arrives preset with the General Function Set. 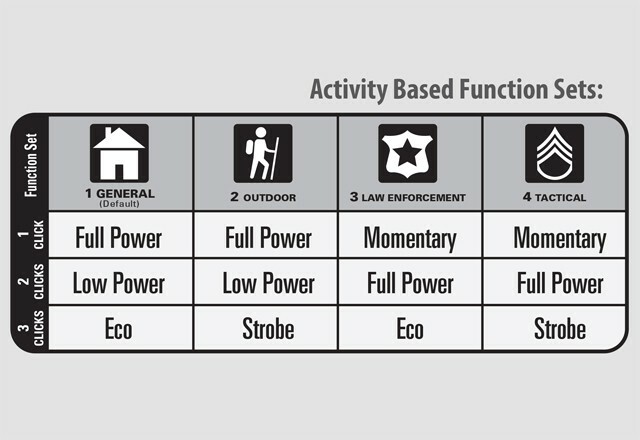 You can select from 4 function sets, based on your activity. See the Function Set table below. Click here to see how you can change your MagLite to a different Function Set. 1. Full Power (1 click): 543 Lumens For the brightest light. 2 1/2 Hours of service. 2. Low Power (2 clicks): 25% level to conserve battery strength. 4 1/4 Hours of service. 3. Eco (3 clicks): Long lasting. Imprint Method: Laser Engraving - appears white. Price includes engraving one location. Imprint area: Barrel 9/16" x 1", Tail 9/16" x 1". We want your final product to look good as much as you do. To help us produce the best looking product with your logo, please furnish us with vector art. This is the type of art contained in Adobe Illustrator files (.ai), eps files, cdr, and sometimes pdf files. If you don't have your art in this format, we can easily convert it for a small fee. We will email a proof for your approval before we put your order into production. This proof shows your logo or imprint superimposed on a picture of the item, or on the outline of the item. ARTWORK MODIFICATIONS: After we send you the initial proof, each additional edit request that you make, will incur a charge of $12. In other words, the first proof is free, and each additional proof is $12 (unless we made a mistake on the proof). Production doesn't begin until you approve a proof. COLOR OF ITEMS: If you place a repeat order, the item color may not be exactly the same as the previous order. This is due to differences in dye lots. BLANK GOODS: They may be ordered in at least the minimum quantity. They must also be in case pack quantities. BATTERIES: The old saying "batteries not included" doesn't always apply here at Maglite. Many of our flashlights come with batteries, and some do not. If they do not, then batteries may be purchased with your order. It is our pleasure to bring you a USA-Made flashlight that you have made a household word.